Patrick was so relieved he decided to buy a bottle of soft drink from a passing vendor’s cooler to go with the N100.00 moi-moi he was eating. He was sitting at the Faculty of Arts Quadrangle amidst scores of other students, some of who were eating, reading, typing their assignments, surfing the Internet or chatting with friends. The quadrangle had become his favourite spot on campus for cooling off between lectures in the overcrowded classrooms where he scarcely got a seat. His Nokia 3310 phone was on top of the books beside him and he was certain that at any moment, he would receive a credit alert from his bank. Patrick was a second-year History student and he hadn’t paid his first semester school fees. The university had announced that the online portal for printing school fees receipts and registering one’s courses would be closed that day. After unsuccessfully soliciting for help from so many people in the past week, he had only one ray of hope to meet the deadline: the promise of a cash transfer from his uncle, Matthias, who lived in Abuja. Matthias was his mother’s elder brother and although a rich trader, he had never helped his family before. Patrick was certain his mother would be cross with him for appealing to her brother because she swore to train her children singlehandedly after he let her down repeatedly in the two years immediately following her husband’s death. But Patrick was hard-pressed and had reached out to every living relative with means that he knew. They all told him they could squeeze nothing out for him because of their immediate family obligations and projects. “So much for Africa’s much-touted extended family networks,” Patrick had sneered after the last call. He had even approached his lecturers and got a total of Eighteen Thousand Naira from two of them, half of which had already been gulped by assignments he couldn’t afford to submit late for fear of having poor results. In spite of the tough financial difficulty at home, Patrick had never been one to beg in the past. But all efforts to raise the money for his fees and other school expenses during the long vacation had been frustrated by his mum’s ill health. Her diabetes had become so debilitating that she stopped her petty trade in fruits. Patrick’s two elder sisters had married artisans right after secondary school, one a welder, the other a painter. The oldest girl, Adanna, had three kids in quick succession before becoming a sewing apprentice. Her sons were aged between 5 and 2 and half. The younger, Nwanyioma, had a two-year-old daughter and plaited hair at home. Their meagre contributions couldn’t pay their mum’s medical bills, so Patrick had to sink in all he made as a labourer at construction sites during the long vacation and the strike that followed. He sent his dear mum, whom he called Omalicha (for she was truly a beauty before the ravaging sickness came calling) to stay with Nwanyioma and her family when he came back to school and still sent them help from whatever he made from working over the weekend or when he cut classes, which had become more frequent than in his first year when his mum was healthier. Patrick’s late father was a victim of a hit-and-run driver. He had been a carpenter and had worked tirelessly to pay for his children’s education. He specialised in roofing houses and had several young men working for him but he was knocked down by a speeding commercial bus as he was riding his bicycle home after a hard day’s work. Patrick had just entered secondary school when the tragedy occurred. His sisters shelved their father’s ambition to see them go to the university but Patrick’s mum encouraged him to proceed. But by his Junior WAEC year, she became sick and he started his labourer work to help. He devoted a year to it after writing his O’levels to save money to begin his university education. Another miracle helped him to complete his first-year fees even before he accepted the admission. It was on a fateful Friday as he came down to carry concrete to the first floor of a building he and others were working on. He saw a handsome young man in dreads talking with their foreman. He was angry that the contractor was not on site and Patrick learnt he was Chigozie, the owner of the building. He and the foreman began a tour of the ground floor while Patrick continued his work. By his third trip down thereafter, the foreman asked him to run after the visitor and return his PDA which he had forgotten on the ground floor railing. Chigozie was surprised at how polished the language spoken by the labourer sounded. “Where did you learn to speak that way,” he asked. “Indulge me,” Chigozie insisted. Patrick looked back at the site and Chigozie understood he was worried the foreman might punish him for not returning promptly. “I’ll explain to the foreman. 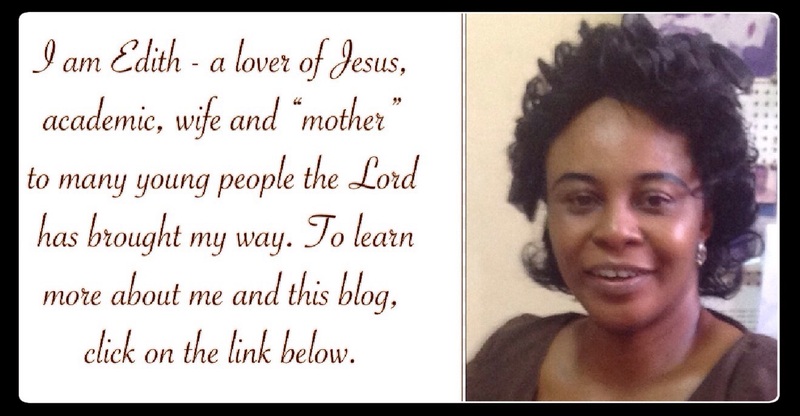 Go on, tell me your story.” Patrick was unconvinced, so Chigozie gave him Two Thousand Naira. Patrick thanked him and gave him his life story in a nutshell. Chigozie, who had also lost his dad at a young age, sympathised with the boy. He reasoned that if his relatives had not picked him up after his dad’s death, he would not be a permanent US resident with the kind of job that enabled him to be putting up this commercial building for his mum’s comfort and sustenance at the age of 28. He wished he earned more, he would have offered the boy a scholarship but he had his mum and poorer relatives to care for plus the huge project (a three-storeyed building) he was handling. Nonetheless, he resolved not to leave him empty-handed. That sounded high for an undergraduate programme. Where do they expect people to come up with that kind of money in Nigeria’s bad economy, he wondered. Or it may be the boy was inflating the figures. Heck, he may not even have got admission but made up the story to take advantage of his kindness. He would need to verify his story before acting. But on second thoughts, he decided to finish with the matter there and then because he had too many things on his plate than checking a poor boy’s story and he was travelling back to the US in a few days. It would break his heart to forget and miss the opportunity of assisting a needy soul. Patrick recited the number and two minutes later, his phone beeped. Chigozie had transferred Seventy Thousand Naira to his account. Patrick was still thanking him profusely by the time he drove off. Ever since he had been seeking help to pay his second-year fees of Forty-five Thousand Naira, he had been wondering where all the Chigozies in the world were. He had been asking God to provide him with a sponsor: just one Chigozie to lighten his load. He wasn’t asking for someone to carry his whole burden but just a concerned man or woman to pay his fees so that he would be hustling for his sustenance, levies, books, etc. Plus his contribution to his mum’s care. Four hours passed and there was no word from his uncle. Patrick had spent most of his day at the quadrangle hoping to rush to a cyber cafe to generate his receipts, zoom off to a bank to pay the fees and back to the cyber cafe to register his courses. By 6:30 p.m., he left for the lodge where he squatted with a classmate. His last two calls had been cut by his uncle. Matthias had not changed. He was still as undependable as he had been to his mum, Patrick bitterly thought. What made it worse was that in waiting expectantly at the quadrangle, he had missed his lectures for the day and an unscheduled test in one of them. Now, he would be looking for not only his regular fees, but an additional Five Thousand Naira in late registration fees. He couldn’t restrain the heaving of his chest and the tears that cascaded down his cheeks as he walked back to the lodge he called home. Thank you ma for the story. It is really motivational. No matter the challenges of life or how life brings it on, we should learn to push further because God never forsakes His children. Yes, we shouldn't let disappointments stop us. God is bigger than any problem we can ever face. You are lifted, Emmanuel, in Jesus' name. I have personally been a victim of unfulfilled promises, and sincerely, it is a very terrible thing! I really wonder if those who make promises without the intention of keeping them, understand this. I've learnt not to make a promise I can't keep. Thank you so much ma. To all the Patricks out there, hang in, hope is on the way. Praise God, Kat! I love reading your perspective on my posts. I pray for the likes of Patrick that God will open a certain and consistent door of favour to them in Jesus' name. 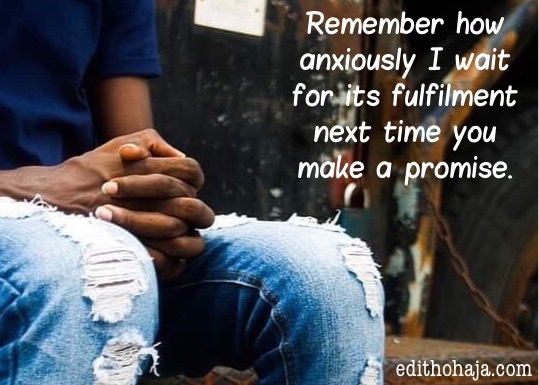 There is no greater fraud than a promise not kept: A friend of mine passed through the same ordeal in her first year. After all the promises made by her uncle to pay her fees, he left her devastated. I believe that God is going to make a way for Patrick. Man fails,but God never fails. Thank you mum for this story. Thank you too, Favour! I love the saying, "Man fails,but God never fails." May He steer our feet away from unfaithful people like Matthias. And may His blessings locate all the needy in Jesus' name. Just if lecturers and school managements actually understood that students actually go through serious issues and help us by stopping unnecessary increment in school fees and compulsory buying of their textbooks. Well, This is Nigeria!!! More understanding is definitely needed. It's important that students seek help early too so that by the time deadlines approach, they may be under less stress. May God supply you with abundant grace and wisdom in Jesus' name. There is no greater heartbreak than a promise unfulfilled, 'cause it has it consequences, like the case of Patrick - all hope is lost for him. A promise is a debt, people should try as much as possible to fullful their promises 'cause we don't know how that little promise can be a game changer in that person's life. As sad as it is, Kingsley, I don't think all hope is lost for Patrick. You are lifted in Jesus' name. Thank God for you, Oma! May your days be filled with God's goodness in Jesus' name. What a tragic story , i was happy he found favour in the middle but at the end things got really bad. Indeed, as the saying goes, "don't make a promise u can't fulfill". I wish more people kept that saying. Anyway, as Chinenye said, may we encounter the Chigozies and not the Matthiases of this world in Jesus' name. This is really a sad one, but so realistic. My heart goes out to those who can’t afford most of their basic needs. It’s really a painful experience but never give up because God will not forsake you at the end. Never! True and very reassuring, Chioma! Have a blessed week! Yes, my dear! I thank God everyone is not like Matthias. I pray you encounter the favour you need this week in Jesus' name. If only Patrick's uncle know what Patrick is passing through at the moment,He will never make promises that he can't fulfill.He allowed the poor boy have him as his last hope but he disappointed him at last when he needed him most. This story has just thought me not to put my trust and hope on man but on God. Thank you mar for this food for thought. Mar? Lol! You are richly blessed in Jesus' name. my heart goes out to Patrick, who's only crime was trusting a relative. A lot of students in the university go through similar ordeal. you could have a course mate who has a similar experience as Patrick. if you know that you can not fulfill a promise, then why make it in the first place, why raise a persons hope only to bash it because of your own selfishness. Breaking a promise is the worst thing you could ever do to a person. just imagine, if God had broken the promise he made to us about life after death, where would we be now. This story thought me that instead of making promises that you can't keep, don't make them at all. At times,we all see this as a mere story without knowing that people pass through hell In reality.many students here in school go through a lot just to make sure they get educated,they fall victims to many things; unfulfilled promises, slavery, depression,e.t.c.Patric's story is a presentation of it. I really feel for poor Patrick. I know what that kind of wait feels like as then to be met with disappointment. His uncle should have not promised anything at all when he knew that it would not be fulfilled. Why raise someone's hope and then crush it to the ground. There are many people like Patrick in this world, I pray that God sends them a miracle helper. Hmm. What a Wicked uncle. This is tragic, a boy who has gone through hell should not be left with regrets. I enjoyed the story, at a point I was wondering what will become of Patrick. I believe you will continue the story sometime. Good work Ma. Ma, I've seen cases of worse experiences. Cases where not just one uncle is wealthy but many are wealthy and even those the father of the fatherless or orphans help train, they turn a blind ear to their plight. Indeed God is the rewarder of all things if not the cases of these unfulfilled promises from around one even amongst classmates and friends can be very disheartening and discouraging. Thanks for the amazing post ma. There is a saying that goes like this ,do not expect anything from anyone because expectations always hurt.whenever we are being promised of something by someone that they will do this and that for us,we should not put all our hope on the promises because human beings are dynamic and they can disappoint at anytime especially when you needed it most,looking at the case of Patrick and his present predicaments where his maternal uncle promised him of helping him pay his school fees and at the point in time ,he disappointed him forgetting that things could turn around within a twinkle of an eye whereby Patrick would be in a good position.we should try and accomplish every promises we make to people or rather we shouldn't pronounce it at all before the person. God always has a way of sending help to the needy, even during the most difficult times. This story made me to understand the frustration some students pass through when it comes to the issue of paying their school fees. It is really apalling, seeing people suffer to the point of frustration and depression, when they have relatives who are buoyant enough to help them. I pray that God will always send helpers our own way, when we are in need of help. Aunty I really don't know what prompted you to come up with this piece but whatever it is, it should equally prompt you to come up with a happy ending for it because I am your story and my present predicament can't just continue like that of Patrick's. i need a glimmer of hope. Please give it a happy ending, tell me he got to pay his school fees at the end. It's impled, Victor! But the story would not bring out the heartbreak that broken promises bring so graphically if it ends happily. The Lord is on your side, my dear! This is disappointing! I fill for Patrick. why must somebody be so wicked like this. Mathias should understand that no one knows what the future will amount to. Patrick could be his savior in Future. All I will advice Patrick is to look up to God. He Will never forsake him. oh God, that is how my uncle promised me a whole lot but he is no where to be found now, he even stopped picking my calls. i felt really bad and angry. poor Patrick, i just wished the story never ended because i kept reminiscing if i have ever promised and failed, well sha promises could be broken this days but not on serious notes abeg! bless up ma. This story is a sad one. So many student are faced with problems but I love what Patrick is made up of. He is a fighter and I encourage every student to be as hardworking as he is whenever things like this should turn up than quitting. A lot happen for us to learn lessons"never to put your trust in man,don't lean on your own understanding,in all your ways acknowledge him,and he will direct thy part"I definitely believe God is still working on Patrick to make him what he ought to be,I pray his uncle will live and see him become somebody in life.God will raise another chigozie,He can,the heart of the king He said is in His hands.Thanks ma for this piece,its indeed motivating. While reading this story, I was so touched because in it,I saw the typical ordeal students that don't depend on their parents face. As Patrick, I would honestly prefer I was told blatantly of the impossibility than to hang my hopes around a person, only to be tossed out harshly at once. Now, Patrick has lost on both ends,both the school fees he couldn't pay, the lecture he missed, the test he missed and also the additional levy he would have to pay for his late compliance. On this note, make no promises than make one and don't fulfill. A beautiful piece: heart warming, with an uplifting moment, and a tragic ending. 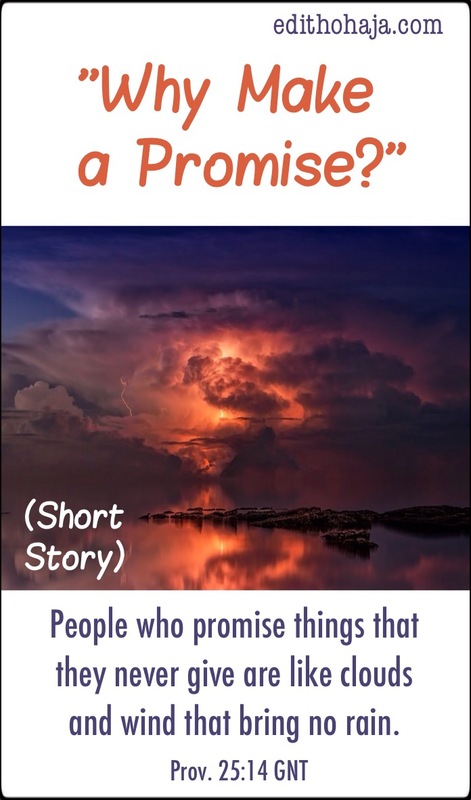 This short story has a fine blend of hope, strength, persistence and faith. A story that explores the goodness and faithfullness of God; the goodness and faithfullness of God to those that firmly put their trust in him. It also explores a strong theme of lies, raising the hopes of a desperate being sky high with untrue words and then shattering it to the ground with unexpected and unforseen actions. At times, God allows some things to happen in order to expose the fake people we have in our lives. Real situation exposes fake people. If Patrick was not having hard times, he wouldn't have know that his uncle is a fake fellow. But one thing is for sure ; a help of a mere mortal cannot be compared with that of God. That his uncle didn't help him does not mean that it's over, rather it simply means that he doesn't want to be part of his success. All he (Patrick) needs is God's favour and a little expansion of his effort. It's not matter of graduating with his mates, it is matter of being there at right time. That is what actually counts. Nawa o! We are humans and it is understandable that we are prone to disappoint our fellow humans. But it is really wrong to make promises you can't fulfill. Many people make promises that they know they can't fulfill just to boost their status quo. Sad thing!!! I pray God helps us. Thank you Ma for this post. So heart breaking 😢... I had same experience also and know very much how painful it could be. My dear Patrick wipe your tears, have faith. Sometimes we go through difficulties so we could learn i.e Gods discipline (Hebrew 12:5-8 ). Believe me dearest "The God that gave you that ADMISSION will surely give you GRADUATION". Your uncle is not your maker nor your destiny holder. You're blessed! Just be strong, your own very miracle is by the corner . Situations like this often happens. Its heartbreaking promising someone without fulfilling them. People ask for a favour not because they want to but because they are in need and can't afford it. What we have today is by his grace, let's use it wisely. 😢😢 hmmmmmm, what an emphatic story, mtchew, man cannot be trusted, why is this? It is because he is man(but this shouldn't be an excuse for wickedness, making promises you very well know you can't fulfill is the very height of wickedness) Finally, Man's whole trust should be in the one who made him, his creator, He's the one who indeed can and will never fail. Ma I believe Matthias is not a good uncle because he knew how important that money is to Patrick. Anyways God will always send a helper for his children and its better not to promise than to promise and fail. Thank you ma'am for these words. I'll never make promises I can't fulfill or keep up to, because in making them, I might end up hurting someone so badly, that the person might not or will never forgive and that will be too bad. Even the bible says "it is better not to make a vow, than vow and not fulfil" Ecclesiastes 5:5. Good bless you ma. Honestly this story portrays what most of us are going through in life, it only takes God grace for some of us to overcome this bitter moment of life because some will just give up. All I ask God is for his grace to always remain sufficient in our lives Thank you ma for this story I know it will make us to always fulfill any promise we make and also to help the needy among us in any way we can. Sad. There are a lot of persons who do not fulfill promises they make without weighing the consequences. May God help us as we desist from making vague promises and people like Patrick as well. Oh my! That's just the weight of a promise. You don't realize how well it is valued by the person you made it to, until you fail to keep it. I hardly make promises but when I do, I make sure to keep them. I feel for Patrick and many other Patricks out there. Certainly, God is not asleep, so don't lose hope. Great piece Ma. Oh poor Patrick, this story reminds me of Jeremiah 9:4 "Let everyone beware of his neighbor, and put no trust in any brother, for every brother is a deceiver, and every neighbor goes about as a slanderer." Men are unpredictable, even when they know they won't help they make false promises. God still remains the solution and surely he must help his people. Thank you ma for this inspiring story..
Reading this makes me ever grateful to God, for providing and blessing me through my parents; I can't imagine myself without guidance in a world like this. I pray that God will send help and people to provide for students without means to survive . I hope this story is fictional o, because it's doing me like I should go and beat somebody o. Haba, why hang someone's hope like that, 'kukuma' tell him to use the door. Independence is the word, I loath this uncle and aunty demands, it rarely comes to a fulfilled stage and if at all it does it takes time and pressure. Did you mean diamonds! Demands don't make sense in the context. Bless you!